Why the quest for happiness is making us miserable. Everyone wants to be happy, but what does it mean and are we looking in all the wrong places? In a world where data is the new currency, social media is turning us all into walking, talking billboards and brands and we're meant to be mindful, manifesting and present, isn't it a bit rich to be expected to be happy too? Why do we want to be happy? Why is happiness the king of all emotions? What does happiness actually mean? After a lifetime spent actively searching for happiness as well as studying it, communications executive and yogi Lisa Portolan shares valuable insights into how we have made happiness a science and an industry, created products around it and supported it with a whole heap of advertising to ensure that works, but is 'brand me' just a recipe for unhappiness? 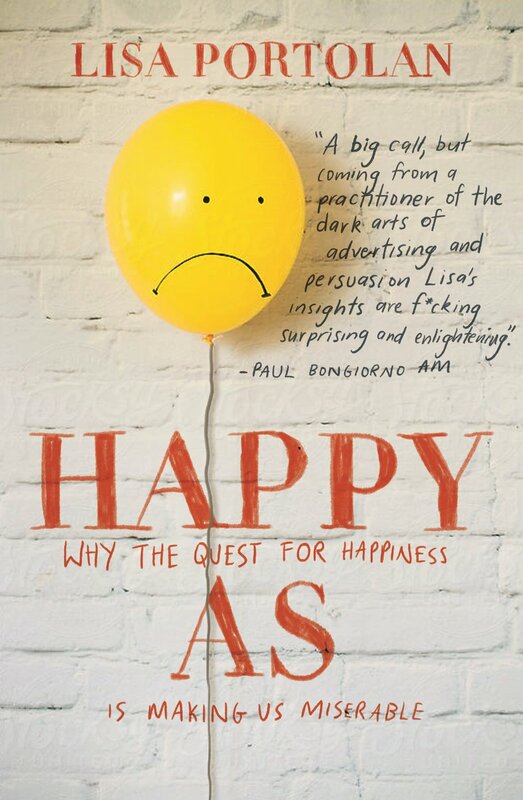 Happy As examines how the concept of happiness is constructed. Starting off with the Greeks and Aristotle, who first generated the notion, to today’s shiny #happy presence on social media. What is it exactly, and do we have any chance of actually experiencing real fulfilment within our lifetime? As we unpick the happiness riddle, we discover that the emotion is intrinsically linked to a sense of identity. We believe that by defining the self and being someone, Pandora’s box of happiness will finally show us it’s key. But are we seeking identity in all the wrong places? In a time when we can be anyone, have the parameters become too lax? In seeking identity through our consumer culture and social media, we’re ultimately led further from the source and identity and fulfilment continue to allude us. Happy As espouses a radical way of conceiving the self, happiness and identity – that is through the notion that we are all essentially someone to begin with, and the rest of it, they’re all just decorations, embellishments, which we could do without. Lisa Portolan is a writer from Sydney. Her debut novel Seesaw (Barringer) was released in Australia in December 2015. Her new novel, Happy As (Echo) was released in July 2017. By day she's a communications and marketing professional, and has worked on a number of large-scale communication campaigns, and industry rebrands. She is also a freelance journalist, having had articles published in Feast Magazine, the Australian Financial Review and blogs for Huffington Post, the Guardian, Ten Daily, Mamamia, Elephant Journal, Yoganonymous, Rebelle Society and HerCanberra. She has a Bachelor of Communications (Journalism), Bachelor of International Studies and a Masters of International Studies and studied at the University of Technology Sydney, and L'Universita degli Studii, Bologna, Italy. She is currently completing her PhD on the happiness revolution. She is a qualified yoga and meditation instructor, and her interest in happiness began as a result of a personal quest for purpose. She embarked on a doctorate on the link between happiness and its construction in 2015, and from there became interested in the links between happiness and identity. Since then she has progressed her doctorate’s focus to the study of socio-cultural paradigms, including happiness, love and success – examining the construction of these through communications, religions, dominant narratives and culture. She lives in Sydney with her husband and daughter.